It’s been a busy couple of weeks, both with my day job and working with suppliers to get the best price and quality on parts for the hybrid driver but I do have a driver kit update. I have finalized the supply chain and received all but the passive components and packaging materials. I expect everything to be here by the end of January. Once I have all the parts I’ll take the photographs for the plans, which will be available for free. I also want to make a test rig for the hybrid driver ICs and the isolated DC to DC converters. They are critical components and cost a decent amount. I want to know that they are performing as expected before they go out in the kits or machines. I have a couple of ideas for building a simple but detailed and accurate Arduino based performance curve profiler similar to those used for testing transistors, diodes, and other electronic components. In the meantime, I’m getting back into the code using the two new driver boards I build from the spare components. I dropped a harmless little AA on my desk while changing the batteries in my mouse. The battery bounced and rolled away, I didn’t think much about it. A few minutes later I noticed my screen took a hit… awesome. The outer glass isn’t even cracked. It was one of the substrate layers that broke and let out all the magic liquid crystals. 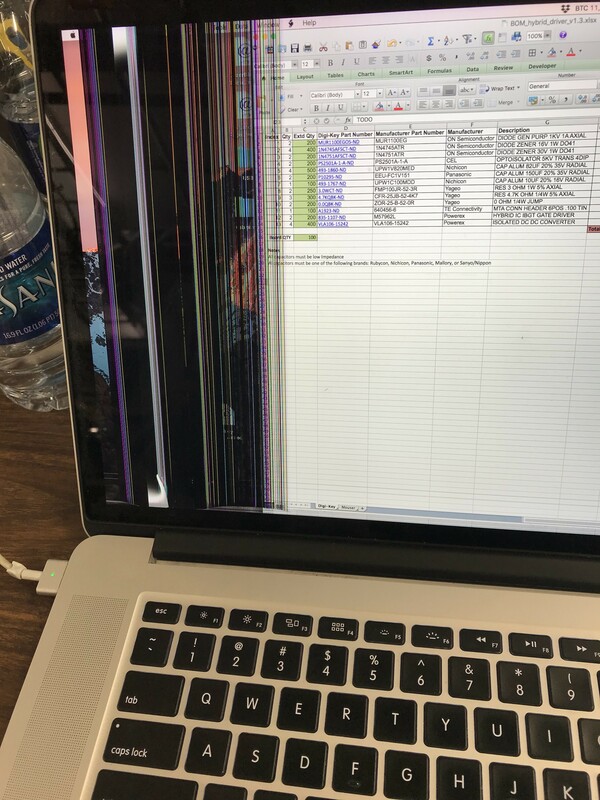 Looking around for a replacement LCD for my MacBook Pro Retina, 15-inch, Mid 2014 it seems like $300-$390 is the price range, ouch! I saw some cheaper off brands but this is a beautiful Retina display, and I don’t want to change it out for some knockoff junk LCD. I have been looking at the new MacBook Pros, but I genuinely don’t like them. The taskbar is a POS gimmick, and the keyboard feels like a toy. I switched to using MacBooks around 2009 when I got fed up with Windows interfering with my work. An [NTFS file system error] blue screen of death the night of a large network activation for AT&T Lightspeed/U-verse was the last straw. I went out and bought my first Mac the next day. Yes, Mac hardware is costly, but it JUST WORKS! It is always something with Windows. I was tired losing valuable time fixing issues, updating, reinstalling, etc. The MacBooks I have used have ALWAYS worked rock solid. I run CleanMyMac to keep things tidy and a Time Machine at home which is the most intuitive and real world usable backup system ever, for a personal computer at least. I didn’t mean for this to be a MacBook fanboy review or a windows roasting session, I still use windows too. Personal my favorite OS is Debian, maybe I’ll get a Linux computer. Probably not though, I just run VMware when I need it locally. Besides, I do love the integration between all my devices that Apple affords i.e., desktop, laptop, tablet, phone, TV, etc… It’s just that this is the first physical problem I’ve ever had with a Mac and honestly I’m sort of surprised how easy it broke considering how rough I’ve been on them over the years. I’m going to order a screen today. I just tell myself, “Don’t worry, you can sell this Mac for about a grand when you upgrade!” Still, what a disappointing accident.